Works In Progress: A little knitting goes a long way. A classmate asked me to teach her how to knit. During a self-introduction exercise where I said my new hobby was sewing clothing, she asked me to teach her to knit a scarf. Sure, I follow the logic. It has been a long time since I knit something. We went to the craft shop together and bought all the materials we’d need for chunky scarves. I’ve never done that for a knitting project before. It was quite satisfying. 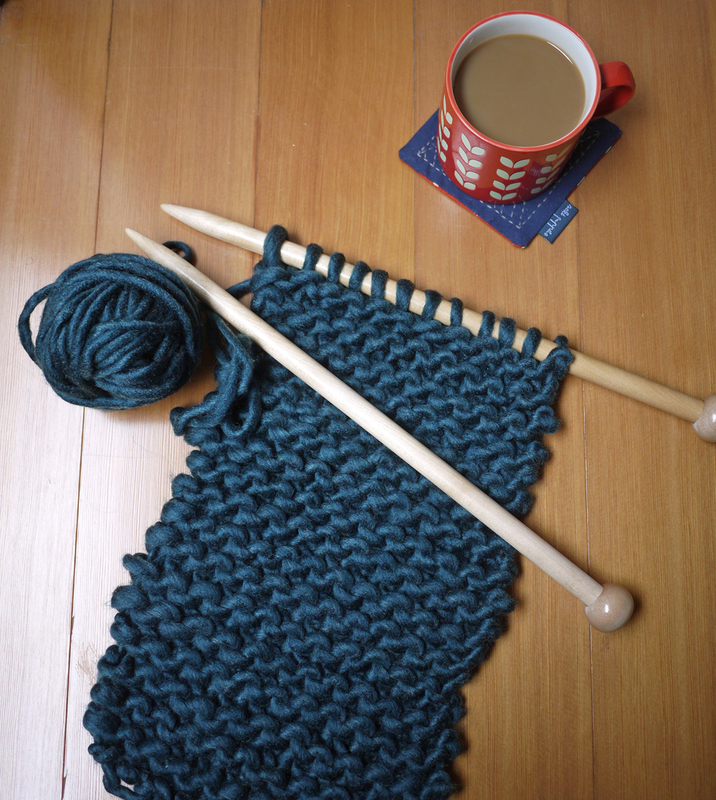 The weather is turning chilly and it’s an overcast morning, quite right for a knit. Have you started cool weather knitting? What are you making?! This entry was posted in Crafts and tagged DIY, DIY knit, knitting a scarf, winter. Bookmark the permalink. I am about to start my winter knitting too:) A friend brought me four knitting magasins with modern patterns! I’d like to make a cozy cable cardigan and a top from wool and angora. Wanna go to AVRIL one of this days? Yes! I just bought a book about snoods! Love the colour of that yarn! I need to get back to my latest knitting project, too. A 1×1 ribbed scarf, 100% wool, for the winter. I’ve been knitting it on and off for a year, and lately I’ve just been so busy that I haven’t had time to work much on it. I’ll be the end of winter by the time I finish it, at this rate! Sounds beautiful! Can’t wait to see it!